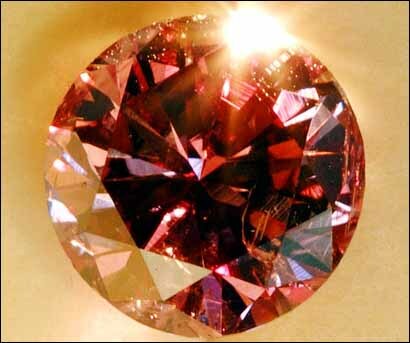 According to British Press reports, this rare cranberry-colored diamond surfaced in London sometime in 2002. The diamond was graded by the British Gemological Institute in London. It is believed to be one of its kind and originated in the Amazon basin. It is being called 'The Supreme Purple Star'. Reports say the color goes from a deep purple to a deep to vivid purplish red. The weight is reported to be between two and five carats. Some speculate it is more likely between four and five carats and it is believed that the collector was unaware of the rarity of the stone when he took it to a London appraiser. The owner will have the stone graded by a major laboratory with plans to sell the stone. The clarity appears imperfect from photographs. Some speculate this diamond may be rarer than a red diamond and might sell for more on a per carat basis. Others contend it is worth less than a red diamond. The owners are hoping the diamond will fetch about $4 million per carat. Whatever became of the stone is unknown.